The ASU Schedule of Classes for Summer and Fall is now available. I am teaching two sport philosophy related classes. Unit: Philosophy and Sport: What is ‘sport’ and why study it? Unit: Sport and Society: What is the social impact of sport? Unit: Is it ethical to run up the score? Unit: Is it wrong to foul? Unit: Violence in Sport: Can fighting or football be justified? Unit: Should performance-enhancing drugs be banned? Unit: How should we balance fairness versus opportunity? Unit: What is the role of money in sport? Unit: Is being a fan moral? An inquiry into philosophical issues in sport. Topics and readings will vary, but may include: the nature and definition of sport, the mind-body relationship in sport, epistemological issues in sport technology and officiating, and the aesthetics of sport. Since “Sports Ethics” examines ethical issues in sport, this course will not primarily deal with ethical issues. McBride, Frank. “Toward A Non Definition Of Sport.” Journal of the Philosophy of Sport, vol. 2, 1975, pp. 4–11. Schieman, Kevin. “Hopscotch Dreams: Coming to Terms with the Cultural Significance of Sport,” in Defining Sport: Conceptions and Borderlines. Ed. Shawn E. Klein. Lanham, Lexington Books, 2016. Suits, Bernard. “Words On Play.” Journal of the Philosophy of Sport, vol. 4, 1977, pp. 117–131. Roochnik, David. “PLAY AND SPORT.” Journal of the Philosophy of Sport, vol. 2, 1975, p. 36. Suits, Bernard. “Tricky Triad: Games, Play, and Sport.” Journal of the Philosophy of Sport, vol. 15, 1988, p. 1. Meier, Klaus V. “Triad Trickery: Playing With Sport and Games.” Journal of the Philosophy of Sport, vol. 15, no. 1, 1988, pp. 11–30. Cordner, Christopher. “Differences Between Sport and Art.” Journal of the Philosophy of Sport, vol. 15, no. 1, 1988, pp. 31–47. Kaelin, E. F. “The Well-Played Game: Notes Toward an Aesthetics of Sport.” Quest , vol. 10, no. 1, 1968, pp. 16–29. Wertz, S. K. “The Knowing In Playing.” Journal of the Philosophy of Sport, vol. 5, no. 1, 1978, pp. 39–49. Breivik, Gunnar. “Zombie-Like Or Superconscious? A Phenomenological And Conceptual Analysis Of Consciousness In Elite Sport.” Journal of the Philosophy of Sport, 2012, pp. 1–22. Russell, Js. “Are Rules All an Umpire Has to Work with?” Journal of The Philosophy Of Sport, vol. 26, 1999, pp. 27–49. Dixon, Nicholas. “Canadian Figure Skaters, French Judges, and Realism in Sport.” Journal of the Philosophy of Sport, vol. 30, no. 2, 2003, pp. 103–116. Collins, Harry. “The Philosophy of Umpiring and the Introduction of Decision-Aid Technology.” Journal of the Philosophy of Sport, vol. 37, no. 2, 2010, pp. 135–146. Mcfee, Graham. “Fairness, Epistemology, and Rules: A Prolegomenon to a Philosophy of Officiating?” Journal of the Philosophy of Sport, vol. 38, no. 2, 2011, pp. 229–253. If you were not able to attend the Sports and Popular Culture Panel, here’s the video. Sports and Popular Culture; Faculty Panel Discussion from Arizona State University on Vimeo. What is the moral and philosophic value of sport? Does sport provide, even in its competitive construction, an essential space for social cohesion in the modern world? How does sport provide a means to explore the broader ideas and institutions in society? 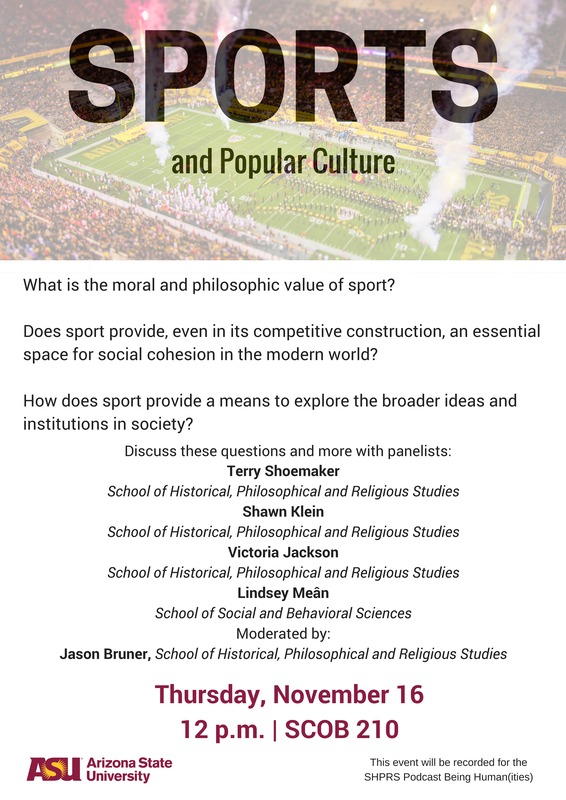 Discussion about these questions and more at ASU’s School of Historical, Philosophical, and Religious Studies Sports and Popular Culture Panel. Moderated by Jason Bruner (School of Historical, Philosophical and Religious Studies). Date/Time: November 16, 12 pm. I’m excited to announce a new online course being offered in Session A of Spring 2018: PHI 394: Philosophy of Sport. An inquiry into philosophical ideas and issues in sport. Topics and readings will vary, but may include: the nature and definition of sport, the mind-body relationship in sport, the effects of technology on sport, epistemological issues in officiating, and the aesthetics of sport. Since our “Sports Ethics” course examines ethical issues in sport, this course will not deal with primarily ethical issues. Can we, should we, define sport? How does sport relate to: play, games, art? What can we learn about the mind/body relationship from sport? What does sport presupposed about mind and body? What can we learn about epistemology and metaphysics through sport? Does sport presuppose particular theories about reality or knowledge? How does technology change the ways we understand and engage in sport? What role should technology have in officiating sports? How do referees, umpires, etc., relate to the rules? What parallels are there to how we might understand law? This course counts an upper-division elective credit. Talk with your advisor if you are interested in taking this course. I will be teaching Sports Ethics at ASU this Fall. For ASU students: this course can be used to meet part of your upper-division elective requirement. A study of moral issues in sports, including, but not limited to, the value of sport, the nature of sportsmanship, the prohibition of performance-enhancing drugs, the value of fandom, the social effects of sport, and the role of danger and violence in sport. The class will meet Tuesdays/Thursdays 10:30 – 11:45 am. The International Association for Communication and Sport (IACS) is hosting the 10th Summit on Communication and Sport. The Summit is scheduled for March 30 – April 2, 2016 in Phoenix, Arizona. They recently sent out the Call for Abstracts for papers and panels. The deadline is October 14, 2016. Information on submission is at the IACS website. Here are the topics and readings for my Sports Ethics this fall at ASU. How can Sport affect Society? Is it ethical to run up the score? Is it wrong to foul? Is violence in sport okay? What is the role of money in sport? Is it ethical to be a sports fan? Department of Economics here at ASU and uses this fantasy-like game to teach the his students about the economics of sports. If you are an ASU student and interested in sports, you should look into taking this course (as well as my Sports Ethics course). Sports provide an endless number of great examples that can be used in the economics classroom, and countless teachers have drawn on them for a wide range of courses and topics. But for a class on the Economics of Sports, I thought I’d try making the example the lesson. In fact, I have built a syllabus which revolves almost entirely around an elaborate simulation of the sporting world which I call The Big Leagues. In my section of 68 students, we have organized into 30 teams, each owned by a group of two of three students. In their groups, students must manage their franchise, making decisions about where to locate, how big and how nice their stadium should to be, what strategy to take to win games, what prices to set, and what coach to hire. As a league, students must also grapple with a Players Association and vote on the rules which will govern their league. All the while, they need to manage their books, and make sure they end the game with enough profit to buy their grade for this portion of the class. By acting as the owners, students end up experiencing the lessons they’d learn from a Sports Economics class first hand. Leagues collude to keep player salaries down, and are combated by the players’ union that threatens to strike. When the league is dominated by one or two teams, and matches are no longer competitive, fan interest (and TV revenue) declines. My game also allows owners to dope their players in secret, boosting their performance at the risk of being found out, and each semester I get to see an institution deal with the fan and media wrath after a huge swath of players get caught, voting to impose fines and punishments on each other. They also have to work through complicated formulas and gut instinct to figure out what the profit maximizing prices for their tickets and luxury boxes are, the bread and butter of any good economics class. The list of complexities goes on and on. Stadiums degrade, players develop across seasons, owners choose actions which influence both of those things, players have ‘suits’ which have combination effects when put on a team with other players, teams can field substitute players, different general managers and different coaches enhance different strategies both for profits and for wins, and contracts with players can include different clauses that give the teams different options down the road. The rulebook for The Big Leagues is 21 pages long, but as one of my students put it recently, “the more you play the smaller the game gets.” In other words, it is a lot easier to understand that it sounds. To make sure they get all the lessons the game has to teach, I devote about 50% of my class time to it. The other 50% is devoted to linking up their choices and outcomes in the game to the real world. Given its complexity and startup costs, I wouldn’t expect a lot of instructors to adopt the game. And that isn’t even mentioning all of the spreadsheet maintenance and troubleshooting needed to keep the game running from season to season. What I can report though is its effectiveness. Like the proverbial frog in boiling water, little economic lessons are incrementally imparted with every decision the students make in the game, and they barely realize how much they’ve learned until I point it out to them. And given my discipline’s disinterest in finding alternatives to the lecture-based format, they also find it to be a refreshing change of pace. If you would like to learn more about The Big Leagues, please feel free to contact me at brian.goegan@asu.edu. After having taught Sports Ethics at Rockford University for many years, I’m bringing Sports Ethics to ASU this Fall.